Moore Hanna, P. (2012). Learning phrasal verbs autonomously. Studies in Self-Access Learning Journal, 3(2), 204-211. This paper describes the design process of a learning object (LO) for the acquisition of phrasal verbs (PVs) in English, which are a particularly difficult aspect of English as a Foreign Language (EFL) for many learners. As such, learners can benefit from the provision of greater opportunities for practice in this area. 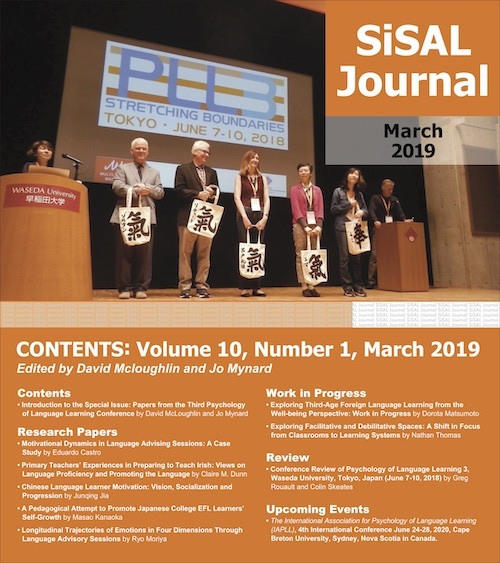 The PV problem is approached as a semantic rather than a syntactic problem, and so the LO aims to present the learner with contextualized, meaningful practice of PVs with a view to developing independent learning skills. The paper discusses the twin problems of PV use in different language styles (formal vs. informal) and the polysemy of PVs, both of which have been found to contribute directly to learner difficulty (Side, 1990; Dempsey, McCarthy & McNamara, 2007). The way in which the LO attempts to resolve these issues is described in the hope that other materials developers may find them useful. The purpose of this paper is to review the process of designing an original learning material designed in a Mexican University for use on a Self-Access Centre (SAC) website. The main objectives are to reflect upon some of the problems involved in learning phrasal verbs (PVs) and to suggest ways in which these problems can be addressed in the design of a learning object (LO) for use by independent learners. PVs are of particular interest for most learners of English as a Foreign Language (EFL) since they are frequently an evaluation objective. Teachers often set great store by the fluent and appropriate use of PVs, both in speaking and in informal writing, because they are considered typical of native-like usage. Since language learning is a time intensive process and little time is available in the classroom, a research project was carried out in the Universidad Autónoma del Estado de México to design learning materials which would complement classroom learning. Given that these independent learners are free as to their choice of materials used, learning materials must be attractive to compete with other, commercially produced, learning materials not designed with these learners’ specific needs in mind. the production of modules for learning which can then be inserted into a Moodle platform or other LMS to provide guidance for learners throughout the achievement of a particular learning objective. the variety of activity types available. the flexibility to embed other object types within the main structure, for example, activities in Hot Potatoes (Arneil & Holmes, 1997). the ease with which an LO can be assigned technical descriptions via SCORMS (Sharable Content Object Reference Models), a set of standards and specifications for learning objects, which facilitate their reuse in diverse learning environments. As the target population is independent learners, the overall aim of the unit is not the learning of specific PVs but the development of effective learning strategies to improve the way in which the learning of PVs is approached in the future. An introduction to the topic to set objectives and motivate the student by drawing her attention to the need to learn this particular objective, presented in terms which the learner can readily understand. A series of varied practice activities graded from receptive understanding to productive use and from simple to more complex language. Exercises and tasks include audio, video, and written language, and the examples provided constitute authentic language use. To ensure authenticity, examples are to be taken from the Corpus of Contemporary American English (COCA, Davies, 2008). An area with practice activities to allow the student the freedom to produce those forms considered in the learning objective without the pressure of evaluation. These answers will be peer reviewed to introduce motivation for the production of text. An area providing evaluation activities, some of which are graded and all of which provide detailed feedback to the learner regarding the errors committed. The feedback for these evaluation activities include direction back to exercises within the LO and outwards to exercises on the Internet which could help improve the learner’s performance. PVs are a notoriously difficult part of learning English as a foreign language, no matter what the learner’s native language is. In the case of learners whose native language is Spanish, an important factor in the learning problem is the existence of many verbs with similar meanings derived from Latin, for example, the verb descend has a similar meaning to the PV go down, while extinguish expresses a similar meaning to put out. Since these verbs are formally similar to words in the native language (descender and extinguir) and hence require little learning effort, it seems to the learner that investing energy to learn phrasal verbs which, on the whole, transmit similar meanings is a waste of time. In order to motivate the learner to make this additional effort, she will have to be provided with a good reason. Situation 1: You are leaving your campsite after a weekend camping with friends. (a) Did you put out the campfire? (b) Did you extinguish the campfire? Situation 2: You will hear instructions given to scientists before entering an experimental chamber. Which version is more probable? (a) Please ensure safety by putting out all naked flames and sources of ignition before going into the experiment chamber. (b) Please ensure safety by extinguishing all naked flames and sources of ignition before entering the experiment chamber. The first situation, friends camping together, is quite informal and, correspondingly, 1 (a) is better than 1 (b). In the second, more academic, situation 2 (b) would be considered more appropriate. The use of overly formal vocabulary in informal situations may make the student appear stand-offish and conceited, whereas using informal vocabulary in situations where greater formality is expected will make the student seem less authoritative. Extinguish (sth) (electric) light, (gas, oil) lamp: Make sure all the lights are turned out before you come up to bed. Develop, progress, in a certain way. She realized that Margot wasn’t turning out very well. Produce, make (sth); develop, train (sb): Why go up to the manager in my own factory and tell him the stuff I’m turning out is shoddy and vulgar? Dress (sb/oneself) smartly etc. She always turns her children out beautifully. For the learner the array of potential meanings is somewhat overwhelming. The LO shows the learner ways in which to simplify these to more basic meanings that cover various subtypes. For example, in the case of the verb turn out, meanings 2, 5 and 6 seem to have an underlying shared meaning of showing up or being produced. The other meanings are more difficult to group, nevertheless, it could be argued that simply asking the learner to look for shared meanings between different subtypes will allow for deeper processing and, hence, more permanent learning of the diverse meanings. Figure 2 shows the first part of an exercise on the PV come across, where two basic meanings are identified. This is followed by an exercise in which the student must identify which of the two basic meanings is being used in sentences. After showing various examples to illustrate the process of simplifying subtypes of meaning, reflective activities are introduced where the answer is not given directly in the main text but can be revealed after the student has had an opportunity to attempt a reclassification of her own. These characteristics of activities in Exe-Learning allow the materials designer to overcome the fact that a teacher is not present during the learning process, by allowing her to withhold explanations until the student has made at least one attempt at a classification. Of course, the effectiveness of these activities is dependent on the student’s sense of personal ethics, actually making the effort to classify meaning before clicking on the button to reveal the suggested answer. However, since the learner can see that the correct use of the activity is in her best interest and there is no grade for right or wrong answers, one would hope that the instructional design would be respected. As with all learning materials, decisions must be taken as to the sequencing of the target structures, that is, there must be some principled way to determine which PVs are included in the material and their order of presentation. In this case, the criteria used were the relative frequency of the PV – determined using the list provided in Gardner and Davies (2007) – and its usefulness to illustrate some of the learning strategies proposed. For example the first two units present PVs formed using the verbs come and go, both of which appear in Gardner and Davies’ top ten (2007, p. 139). Choosing these verbs has the additional benefit of their semantic relation as converses, providing an interesting symmetry to the units. 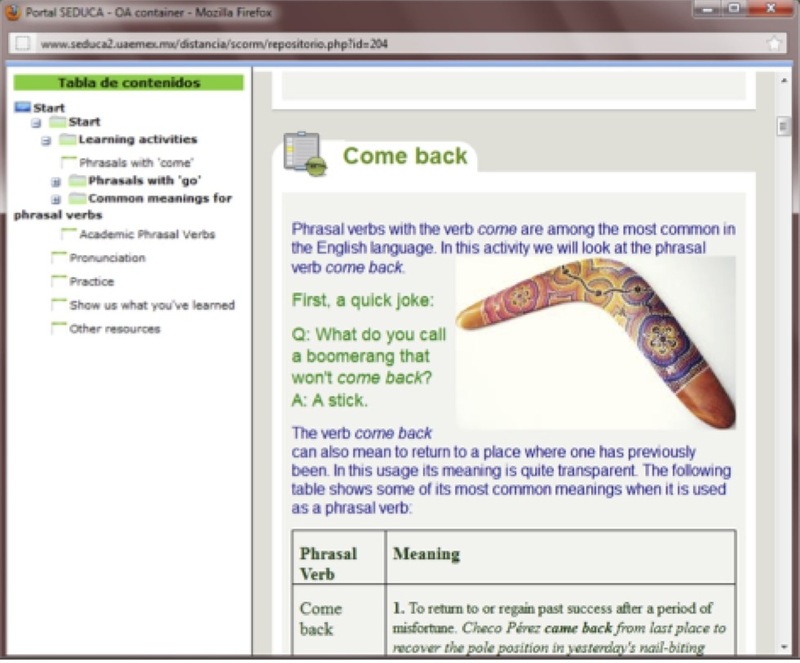 In each case, 8 PVs using come or go with different particles were presented using exercises and learning tasks which reflect the learning strategies discussed above. In all explanations and exercises care was taken to represent authentic language use by choosing examples from COCA. The second criterion, usefulness for presenting learning strategies, is based on the fact that some particles seem to create PVs with shared meaning. For example, it is often mentioned that PVs with the particle up acquire a meaning of telicity (or finished action) (Side, 1990; Sawyer, 2000) for example eat means to consume food, whereas eat up means to consume some limited quantity of food completely, drink is consume liquid, drink up is to consume a limited quantity of liquid completely. Once again the argument is that this could provide the learner with a short cut to learning some PVs. The drawback is that not all PVs with up, which is perhaps the clearest case of this phenomenon, are actually marked for telicity. This is a rule with exceptions, but nonetheless it does constitute a useful rule for many PVs; any short cut to learning is better than none, and the LO points out that not all PVs with a specific particle generate meaning in exactly the same way. The same is true for the particles down, in, and out, which are also used in the LO to practice this learning strategy. As Tomlinson (1998) points out SAC materials are frequently designed for ease of feedback, however, this favors the development of activities which can be objectively evaluated, i.e., have one right answer. These are very useful for learners who are right-brained and respond well to analytical work, but not so appropriate for left-brained learners (Tomlinson, 1998; 2010). 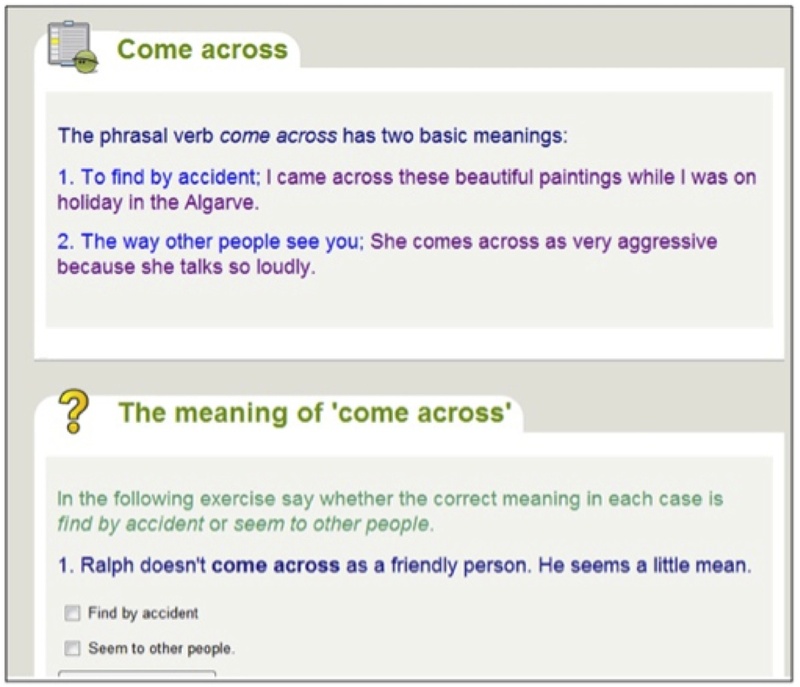 So a variety of activities were included which allow for freer responses without the immediate pressure of a right answer so that the students could practice the use of phrasal verbs in extended discourse and be more creative, for example, the description of a favorite scene from a movie or a review of a favorite book. Once the LO is inserted to an LMS such as Moodle, these longer answers can be shared via the forum for peer feedback or sent automatically to the coordinator for more detailed feedback. To summarize, this paper presents specific ways in which some of the problems associated to the learning of PVs in English can be resolved. It is particularly important to ensure that meaning is the central concern throughout the LO and that strategies for independent learning are developed with constant reference to a specific language point, rather than developing learning strategies for their own sake. Pauline Moore Hanna is a full time professor at the Faculty of Languages in the Universidad Autónoma del Estado de México where she teaches Semantics and Pragmatics in the linguistics department. Her areas of professional interest are designing learning materials and developing academic literacy. The author wishes to thank the editor, Jo Mynard, and two anonymous reviewers for their suggestions which greatly improved this article. Biber, D. (1988). Variation across speech and writing. Cambridge, UK: Cambridge University Press. Cowie, A. P., & Mackin, R. (1993). Oxford dictionary of phrasal verbs. Oxford, UK: Oxford University Press. Gardner, D., & Davies, M. (2007). Pointing out frequent phrasal verbs: A corpus-based analysis. Tesol Quarterly 41(2), 339-359. Kida, I. (2011). Language distance across cultures as a way of expressing politeness and not only. In J. Arabski & A. Wotjasek (Eds. ), Aspects of culture in second language acquisition and foreign language learning. Berlin: Springer-Verlag. Sawyer, J. S. (2000). Comments on Clayton M. Darwin and Loretta S. Gray’s “Going after the phrasal verb: An alternative approach to classification”. Tesol Quarterly 34(1), 151-159. Side, R. (1990). Phrasal verbs: Sorting them out. ELT Journal 44(2), 144-152. Tomlinson, B. (1998). Access-self materials. In B. Tomlinson (Ed. ), Materials development in language teaching (pp. 414-432). Cambridge, UK: Cambridge University Press. Tomlinson, B. (2010). Principles and procedures for self-access materials. Studies in Self-Access Learning Journal 1(2), 72-86.